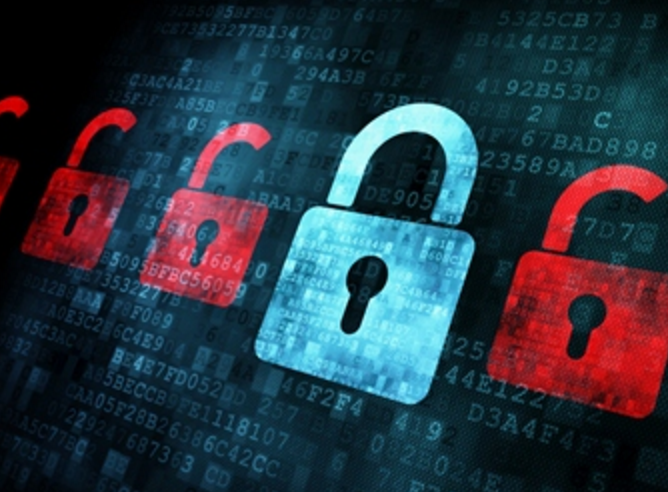 How can I add a layer of security to my online identity? This will be a busy week! On Wednesday, we will have the last of the Cyberviolence workshops we have been running since September. It will be a very interesting and informative event. One of the speakers will be an expert from the European Schoolnet who will speak about the inSafe network, a Europe-wide program to empower children and young people to use the internet, as well as all forms of mobile technology, positively, safely and effectively. Our second speaker is a cybersecurity expert who will explain how we can add a layer of security to our internet usage, to protect our online identity. He has been giving workshops to journalists and human rights activists on how to make their online correspondences more secure and hacker-resistant. (Register here: http://bit.ly/15inqube14) Expect to take a lot of notes! For those curious about cloud computing technology, you are all welcome to our Bluemix Girls’ Night on Thursday. There will be an interesting panel of women entrepreneurs and cloud computing experts who will talk about how (would-be) entrepreneurs could use this new technology in setting up a sustainable business with the same scalability as big tech companies. Register here! The Ministry of Equal Opportunity of the Brussels Capital Region has selected DLI to lead a seminal campaign engaging Brussels adult and teenage women in addressing cyberviolence in their communities. In Fall 2015, DLI will carry out several inQube – female digital accelerator workshops to build awareness about the growing problem of online violence, bullying and hate speech, and provide girls and women with skills and resources for tackling this problem. 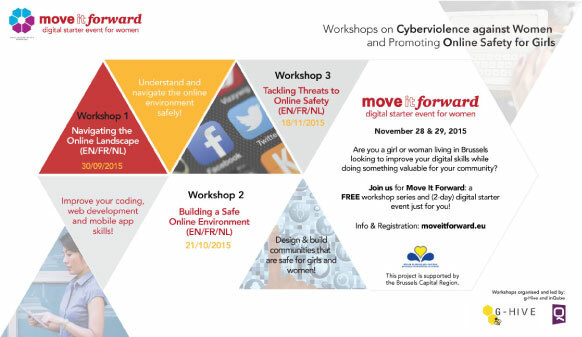 Six workshops will be held at DLI headquarters in Brussels from September through November 2015, culminating in the 28-29 November global launch of a Move It Forward digital starter event for women focusing on Cyberviolence. Participants get to learn from experts in the field of digital safety, psychology and online communities, as well as discuss the topic of online safety with representatives of tech companies and get hands on to lay the foundations for their own safe online community. They’ll also learn to tinker with digital means and build our own solutions. There is a limited number of places available for the six workshops (3 tailor made for girls and 3 tailor made for women) and the Move It Forward digital starer event event for girls and women. You can sign up through the links below. We look forward to welcoming you to help “Move It Forward” with DLI! To partner with or sponsor the Move it Forward Cyberviolence campaign and digital starter event, please contact us! The 2015 Move It Forward project on Cyberviolence is supported by the Ministry of Equal Opportunity for the Brussels Capital Region.